Since the first silicone implants were developed in 1961, various types of implants have emerged. Early silicone implants were made of teardrop-shaped silicone gel-filled pockets that had a Dacron fixation patch on the posterior aspect, while the soft surface was made in the form of a smooth implant. Later, implants that were made using low-viscosity silicone and had a surface consisting of a smooth shell for a softer texture were sold; however, these implants increased the incidence of capsular contracture and implant shell rupture, and, as a result, implants with thicker implant shells and higher-viscosity silicone were sold in the 1980s. Many problems occurred with the early implants, and concerns were raised over potential risks, such as systemic immune disease, connective tissue disease, and cancer. In 1992, the US Food and Drug Administration (FDA) decided to ban the use of silicone gel-filled breast implants in augmentation mammoplasty due to the lack of clarity regarding these safety issues. Later, major companies, such as Mentor and Allergan (previously known as McGhan and Inamed), conducted a long-term cohort study under the supervision of the FDA. 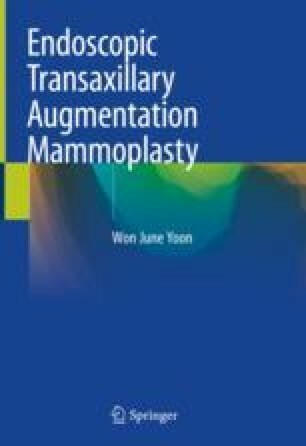 Based on the study, it was found that silicone gel-filled implants were unrelated to immune disease, connective tissue disease, or cancer and that, in comparison to earlier implants, implants with higher-viscosity silicone and improved implant shells were considered to not have overly high risks of implant shell rupture or to lead to an unacceptably high number of capsular contracture events in patients. Based on this evidence, the US FDA approved sales of these improved cohesive silicone gel-filled implants in the United States in 2006. In 2007, the Korea Food and Drug Administration (KFDA) also approved the import and sales of the implants in Korea. As cohesive silicone gel-filled implants with relatively high viscosity were approved, the frequency of the use of silicone gel-filled implants rapidly increased, along with postoperative satisfaction levels regarding tactility. Form-stable silicone implants made of form-stable, highly cohesive silicone gel have been developed and sold; these are fifth-generation implants that are relatively thick and firm, with shells that exhibit less gel bleeding. They generally have a textured surface and are made in a round or anatomical shape. In 2012, the KFDA, as well as the Ministry of Food and Drug Safety of Korea, approved the import and sales of form-stable silicone implants, resulting in the recent increase of form-stable implant use.